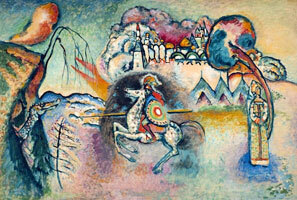 This watercolor was painted in Sweden, where Kandinsky spent the winter of 1915-1916 before returning to Russia. The colorful characters in their folk costumes, the Russian church at the foot of a hill, the Firebird, the warrior-ferrying barge, cutting through the waves – all of these represent the artist’s Russian roots. That said, he didn’t interpret his subjects literally, but sooner freely reconceptualized them.